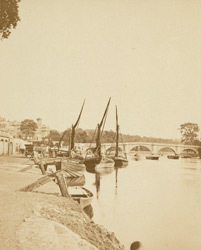 The descriptive letterpress accompanying Russell Sedgfield's photograph of Richmond Bridge makes historical and poetical associations with Sheen and Richmond. This five span bridge remains the oldest Thames crossing in London. "From Richmond Bridge may be seen several noble mansions. Above the bridge, on the Richmond side, are the villas of the Duke of Buccleugh, and Lord Lansdowne. The Bridge, built in 1774-5 (the money being raised by tontine) was made free of toll, after the death of the last annuitant, on Lady-Day, 1859. A most complete history of 'Richmond and its Inhabitants from the Olden Time,' by Mr. Richard Crisp, has just been issued from the press."